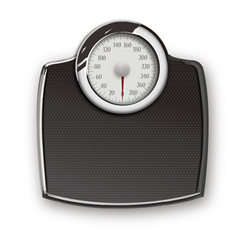 This calculator determines your body mass index (BMI). When using this BMI calculator, it is important to keep in mind that BMI is a reasonably reliable indicator of overall body fat composition for the general population, however it can occasionally be misleading for a person who's body composition is not typical. Since BMI is determined solely from height and weight data, it is essentially an indication of whether or not you fall into a "healthy" weight range for your height. However, since no actual body fat measurement is made when determining BMI, if your BMI should happen to be 25.0 or above the resulting "overweight" or "obese" classification is essentially based on an assumption that the additional weight on your body is from fat rather than muscle. Take, for example, an athletic, 5'11" tall, muscular male with low body fat that weighs 180 lbs. Many athletes, professional or otherwise, fit this general body type description yet they would be classified as "overweight" according to any BMI calculator. There is nothing wrong with the calculator, the BMI classifications are simply targeted for the general population and do not account for that portion of the population that has low body fat but high lean (i.e. muscle) body mass. Rest assured, if you are lean and muscular and this BMI calculator informs you that you are overweight or obese, there is nothing to worry about, it is the BMI classification system that is at fault and you need not be concerned about your weight. On the other hand, if you are not lean and muscular and this BMI calculator informs you that you are overweight, then you are most likely overweight. Classification categories for BMI, as outlined by the World Health Organization, are shown in the table below. The equations used by this calculator to determine your BMI are shown below.